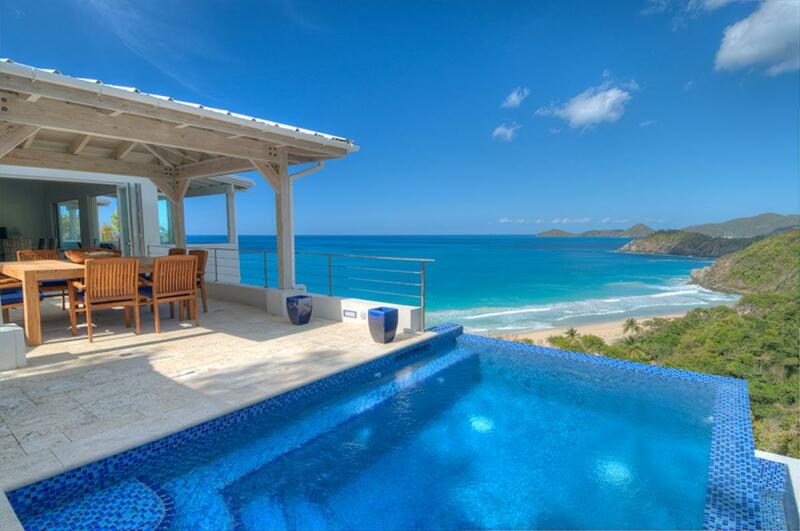 This 3 bedroom villa is a modern paradise for those who want to get away, relax and soak in the beauty of the Caribbean. One of the bedrooms is perfect for all the kids with two sets of bunk beds and long, lounging bean bag chairs. The other rooms open up to the patio where you can sit and enjoy the turquoise waters below or take a snooze in one of the outdoor hammocks. This open, spacious and modern home is quite tranquil, as is the infinity pool which looks like it flows right into the compelling waters of the ocean below. The best thing about Soleil Villa is that not only do you have a stunning view of Trunk Bay, you can simply follow a cleared path down the hillside and enjoy this white sand, practically empty beach whenever you wish. Stairs lead to beautiful Trunk Bay below! At Villa Soleil you have plenty of options for gathering with other guests as well as room to find your own spot to relax. From here you are only a short drive to the rest of Tortola’s many offerings such as snorkeling, diving, boating, fishing, hiking, shopping and dining. The villa can sleep 8, max of 6 adults and 2 children. The Soleil Villa was even better than the pictures portrayed. The villa, Trunk Bay beach, the sound of the waves were so perfect we hardly ever left the villa. This is definitely a place we will return to again and again. When we did venture out we had great meals and ambiance at Sugar Mill, Brandywine Estate and Brandywine Rooftop. Shawna was fabulous, very helpful.